Jefferson House offers security, a harborage, where patients can avoid long hospital stays while still receiving nursing care, intensive rehabilitative therapy, nutritional counseling, selfcare and the psychological support necessary for re-establishing independence in their daily lives. Inpatient and outpatient rehabilitation services are offered in a modern, well-equipped center seven days a week. Physical Therapy focuses on the restoration of a physical function lost through disease, injury or amputation. This service also focuses on the relief of pain and prevention of disability through proper treatment and training. Each physical therapy program is tailored to meet the individuals' needs in everyday living and to re-establish that person's fullest level of functioning. Occupational Therapy focuses on the restoration of fine motor coordination, manual dexterity and sensory perception. Patients work to regain self-care skills such as learning to dress or managing kitchen activities. Speech and Hearing Therapy provides evaluation and treatment of problems in communication which inhibit daily activities. Each patient's unique program of therapy is coordinated with his or her family and other rehabilitative services. Q: What is Rehabilitative Care? A: Rehabilitative Care is designed to assist individuals in regaining a level of useful and constructive activity. This type of care is directed toward individuals who are recovering from an acute illness or learning to adjust to a chronic condition whose goals are to progress to their highest level of independence. Our staff specializes in geriatric rehabilitation, post-stroke, knee replacement, hip replacement, amputees, neurological diseases, home evaluations, orthopedic injuries, wound management and edema management. Q: When might a person need this type of care? Q: What makes Jefferson House unique? A: Jefferson House offers security, a harborage, where patients can avoid long hospital stays while still receiving nursing care, intensive rehabilitative therapy, nutritional counseling, selfcare and the psychological support necessary for re establishing independence in their daily lives. Our goal is to have individuals in this program either return home or progress to their highest level of independence in a maintained living environment or long term care facility. Our rehabilitation therapists, nurses, social workers and nutritional counselors work together to access and meet the unique physical and psychological needs of each individual. 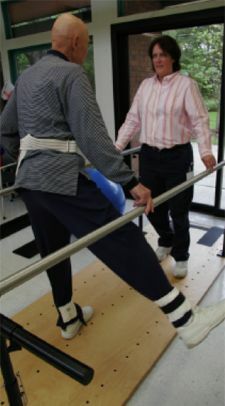 Physicians and other healthcare professionals also coordinate their care with a mutual goal of total rehabilitation. Family and patient participation is encouraged to help speed the process of recovery and to provide continuity of learned functional skills upon discharge.